I enjoyed reading Tales from Ara. The overall plot, which reminded me of Alice in Wonderland, was great at first. 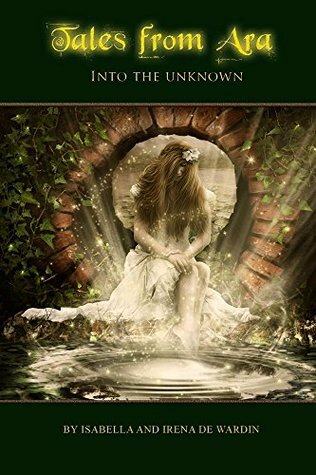 Young, innocent girl falls through a mirror into a strange land and ends up having the adventure of a lifetime while trying to figure out why she ended up in Ara. I loved it and couldn’t read those chapters fast enough. Then Karayan found her and the plot started to get a little less great. By the end of the book, I was a confused mess because the plotline did so many switches that my head was spinning. While Harlette was one of my favorite characters in the book, she also kind of annoyed me. She came across, in some scenes, as amazingly immature and she kept getting herself into situations that made me go “Seriously why didn’t you listen!!”. She was also very naïve and didn’t heed the advice of Karayan or Bernard, her cat. But, like I said, I did enjoy her character. She was kind and she believed the best in people. She also brought out the best in her companions….mainly Karayan. Oh, let’s talk about Karayan. Honestly, I thought he was a controlling jerk who kept jerking Harlette around by her emotions. But there were some glimmers of a decent elf underneath all of that. He cared about his people/kingdom and would do anything to keep them safe and I also think that he did care for Harlette, even though she was a human. Again, glimmers and if the author could extract those out, I think the next book would be 100% better. The whole storyline with Christine was well weird and I couldn’t get into it. I wish that more was given into Christine’s background, other than being Harlette’s foster-sister. I mean, it is revealed that she is a witch, that has almost no powers, and she is the one who sent Harlette into Ara. When I say that the storyline is weird, it is almost like it was put in there to fill in space because, to be very blunt, other than revealing the identity or Harlette’s mother and father, it added nothing to the storyline. Also, she and Harlette’s parents kept referring to Harlette as “The Daughter” but no explanation was given, which drove me absolutely nuts. The main storyline with Harlette and Karayan really threw me for a loop. I loved it up until they stumbled upon the beanstalk. Harlette and Karayan were actually getting along until she decided to take the giant queens challenge to defeat the spirit and had to get Karayan out of the chains. Which they did by sharing an amazing kiss. It was after that when Karayan decided to teach Harlette what she was missing, that the book kind of went sideways and backward. Not going to get into it but I didn’t like the total idiot Karayan became to Harlette. It bothered me on so many levels. The ending of the book was a cliffhanger and you all know how I feel about that. *Why did Harlette’s parents leave her on Earth? Just saying, because now, my opinion of them isn’t that great. *Why is Harlette called The Daughter!! Why: While I did say that I liked the story (I did), what brought my rating down from the 4 that would have given it to a 3 is this: I couldn’t relate to Harlette or Karayan. Also, I was left very confused by the end of the book. Not because of the cliffhanger but because of the 180 Karayan did with Harlette. It confused the heck out of me.